The best recipe organization tool Ever…(note)! I’ve written before about using Evernote for organizing your genealogical research. Now I’ve discovered another amazing use for Evernote that I want to share: Using it to organize recipes & cookbooks! I’ve collected genealogy books and ephemera for a long time, and part of that collection has been old family recipes and cookbooks. My mom clipped and saved recipes, and from her I inherited seven full-sized notebooks and numerous folders full of recipes, both her favorites and those she just wanted to try. Mom was an amazing cook – ask any of our relatives. 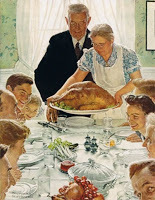 Holiday meals were almost always at our house, with anywhere fro m 10 to 20 or more people around as many tables and folding tables as the house would hold. And not only was her food tasty, as well as “delicious & nutritious”, but mom always looked great by the time it was served. I’ve inherited her love for feeding a crowd, but I still haven’t mastered the art of planning & timing, so by the time folks arrive for a feast, I’m pretty much still look like I should hide in the kitchen. But I digress. The point is, I am the keeper of cherished family recipes. My own daughters are now starting families, and call or IM with questions about the foods they remember. “Where is grandma’s pumpkin pie recipe that’s made with maple syrup?”, or “What’s in your deviled eggs?”. Add to that my own continued obsession of reading cookbooks, and saving recipes I find online, and I found myself looking desperately for a way to organize the recipes I have, so that I can easily find them, and just as easily share them. I kept thinking that the program I was looking for had to be specific to cooking, yet the more I looked, the more I couldn’t find anything that met all my requirements…Until one day when I was working on some genealogy research, clipping images and saving them into my Evernote folders, that it dawned on me. Evernote would be perfect! Not only can I use my wand scanner to scan recipes from books, recipe cards, or scraps of paper or napkins, I can also use the camera function on my phone to snap pictures of recipe cards and send them directly to Evernote, where the advanced OCR capability scans typed documents and indexes them automatically. Think about the possibilities! I can snap a picture, or scan the index pages of my many cookbooks, and then when I search Evernote for, say “enchiladas”, not only will the results be those recipes I’ve entered into my Evernote files, but will also show me which of my cookbooks have recipes for enchiladas in them as well! No more flipping through a dozen or more books to find that favorite English trifle recipes (OK, It’s the one in the Silver Palate Good Times cookbook that I’ve used so many times I even remember the page number – 324) but you get the idea! A Premium account will also OCR index PDF files. Everything’s on the internet! 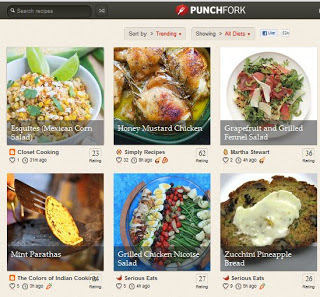 There are dozens of really wonderful recipe websites – Cooks, Epicurious, Foodnetwork, Punchfork… I think I’m on AllRecipes.com just about daily, perusing potato salad recipes, quick dinner ideas, etc. Even though I can save things to my own Recipe Box on the website itself, if I find a recipe that is a ‘keeper’, I can snag that recipe and import it directly into my Evernote recipe folder. You can do this with either the snipping tool that is on your computer’s accessories, or you can install the handy Evernote Clipper – a handy little button that sits on your toolbar waiting to grab web pages and send them to your Evernote folder of choice. The neat thing about using the Evernote Clipper is that it automatically adds the URL of the page you were on into the note, making returning to that recipe page online a snap. Most folks are familiar with the concept of tagging – adding keywords to help find things more easily using a search tool. Instead of creating all sorts of folders and separate notebooks for different types of recipes, I just created one notebook called Recipes, and put everything in there. You don’t have to organize within the folder yourself, because another great thing about Evernote is that it automatically indexes every word in every note – even words in photographs! So you don’t have to use a million tags, since technically all the ingredients are already indexed. I only tag things that aren’t in the recipe, like adding the tag “Family Favorite” to those recipes that I go back to over and over, or “Marcelle Osmer” to recipes that were my mother’s favorites. Another tag I use is “Quick Dinner”, to remind me of meals I can throw together fast. I really appreciate that I don’t have to spend a lot of time tagging, since it’s already done automatically for the most part! Since I’m only just starting organizing all my recipes with Evernote, I haven’t added a lot of photographs, but I plan to. My goal would be to photograph the final result for each recipe that I’ve got entered. When I’m grabbing recipes from the internet, I try to include a photo if one is provided there, too. Want to create a family cookbook? You can easily print individual recipes, or print them all. You can even set them up to print onto 3×5 index cards. Not many of the recipe apps support printing, and I shuddered at the thought of inputting all my recipes, and not being able to print them out if I wanted a copy. Easy to share? You bet. You can easily share individual recipes by email, Facebook, or Twitter by using the easy Share button at the top of the screen. You can also right click on a Notebook, and share the entire Notebook, as I do with my daughters, so they now have access to all the family favorite recipes I have entered so far. With a Premium account, you can allow others to edit and add to your Notebook, or you can choose to just let them to view it. Evernote does even more than I was hoping for! You can easily create a weekly meal plan, and have the recipe list for the week automatically hot-linked to the recipe itself. Just right click on the recipes that you want to put on the list, and choose “Copy Note Link”. Then open up a new note, perhaps title it “Weekly Menu Plan”, and paste what you’ve copied into that new note. Make a list of recipes for the week like this. When you now click on that recipe name, it will open up the actual recipe from your file. So cool! A basic account with Evernote is free. You will be allowed 100,000 notes, up to 25 mb each up to a total of 60 mb a month; 250 syncronized Notebooks, 10,000 tags, and 100 saved searches. A Premium account costs $5/month or $45/year. It increases your note size to 50 mb each, and your total monthly storage to 1 gig. 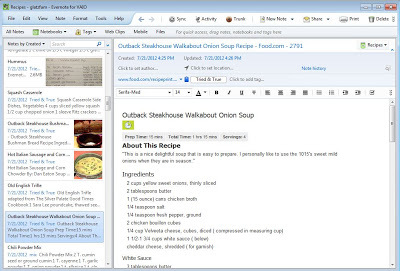 In my humble opinion, Evernote is essential for geneaogy research, and an amazing tool for recipes organization too. My Evernote Premium account is almost as essential as my subscription to Ancestry.com. Evernote has an extension, called Evernote Food. It’s almost it’s own ‘animal’ so to speak, but doesn’t address recipes, or the creation of food, as one might expect from the name. Instead, it is promoted to “Preserve and relive memorable food experiences. From fine dining to family gatherings to a local food truck, remember every delicious moment.” I guess it’s for those folks who always post pictures of their meal on Facebook. I really am not sure. My next goal is to figure out how I will be using Evernote for quilting!